Home>The essential guide to home theatre installation – your local electrician explains all! The essential guide to home theatre installation – your local electrician explains all! In the old days, the local cinema was our only option. However, thanks to HD television, surround-sound and on-demand streaming, home theatres are more affordable than ever. Nowadays, it’s possible to get the full cinema experience without overpriced popcorn littering the floor, people talking, and half an hour worth of ads! It doesn’t surprise us at all that home theatre installation is rapidly becoming one of the most common home improvement projects we work on. What’s involved in home theatre installation? Before you start dreaming of your home cinema, you’ll need to consider everything that goes into a home theatre installation. While they’re more affordable than before, home theatres are still a significant investment for most homeowners. You’ll want to make sure you’re making the right decisions first before making any purchases. 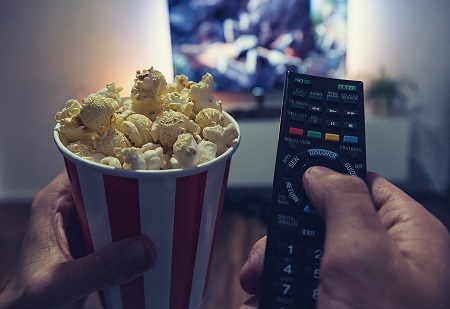 TV versus projection: which one’s best for you? Without a doubt, the most important part of any home theatre system is the screen. There’s a reason we watch movies instead of listening to them, after all! The first thing you’ll want to think about is whether a TV or a projector screen is best for you. There isn’t a clear-cut answer to this question – each one has their own strengths and weaknesses you’ll need to consider. Have in-built speakers – this is great if all you want to do is watch some reality TV without the whole cinematic experience! Allow for a MUCH larger screen area – your walls are your only limit! In the end, the best option for your home theatre comes down to your circumstances. Does your budget allow for a huge 4K TV? How much ambient light is there? How big is your theatre room? All of these questions come into the picture (no pun intended). So you’ve decided what type of screen is best for your home theatre installation. Now the next step: how you’re going to set it up. Most of us don’t think about how heavy a 65-inch TV is until we actually pick the thing up. And while TVs are getting thinner and lighter, they should be installed and mounted by the pros. If you go with a TV, be sure to choose a strong, stable mounting to hold it. More importantly, you’ll want to make sure you choose a sturdy wall to mount it on! Projectors are no different. Projecting straight onto a wall can ruin the picture quality – for the best results, you’ll need a quality screen. Think about where you’re going to mount your projector screen, as well as the type of screen – is it going to retract into your ceiling, or is it going to be permanent? And while you’re at it, you’ll also need to consider where your projector itself is going to go. We know what you’re thinking: didn’t you just say that the picture is the most important part of your home theatre system? While the picture quality is a big deal, sound is just as important! And when it comes to home theatre installation, more often than not, it’s the most complex component to set up. Speakers require ridiculous amounts of wires. No-one wants to contend with wires snaking all over the place, or speaker boxes taking up precious room. Alternatively, you could forgo standalone speaker units in favour of in-wall speakers. These systems can sit flush with your walls, reducing clutter – no more annoying cables or distracting speaker boxes. With in-wall speakers however, cables and wiring run through your ceiling and walls. This is a complicated job, and we recommend enlisting the help of a licensed local electrician. Yes, home theatre installation involves a lot of wiring. And when it comes to wires, it’s best to leave it to an expert! If you lack the technical skills to install a home theatre, you should seek help from your local electrician. Electricity isn’t something that should be taken lightly – in unqualified hands, it can be deadly. More importantly however, your local sparkie will be able to give you professional advice about the type of systems that’ll best fit your home theatre. Screens, speakers, wiring… it can all get very technical. Getting lost, using the wrong wires or accidentally messing up the balance between your speakers are mistakes that are all too easy to make. It’s not just the wiring, either. If you’re serious about getting the most from your home theatre, you’ll want to think about extras. Theatres need to be dark – have you thought about automatic shutters or curtains for your windows? And while we’re on the topic of lighting, you’ll want complete control over your lights. Talk to your electrician about lighting control systems and bulbs that can dim. Finally, there’s the question of cabling. When you choose in-wall speakers or a ceiling mounted projector, we strongly recommend calling a professional to look after the wiring. Any electrician worth their salt will be more than happy to help set up your speakers and projector. Don’t DIY – choose Briggs Electrical for home theatre installation in Melbourne! While it’s possible to set up your home theatre on your own, we don’t recommend it. Leave it to a professional – choose a team that is reliable, on-time, fully-licensed and most importantly, highly experienced in home theatre installation in Melbourne. Briggs Electrical has helped countless homeowners build the home theatres of their dreams. From initial consultation to final fit-out, our team of professional electricians have installed theatre systems in homes from South Yarra, to Moorabbin and beyond. Give us a call on 1300 300 222 or fill in this form to see what we can do for you!